This one is for my niece. Another girl in the family is on the way. This is a shaker card filled with tiny pink and white heart confetti. It features a baby girl dress on a hanger and it is framed in scallops. The background is delicate flowers. It includes gold glitter flower accents. Supplies: Unity Insightful Meadows and It's A Girl stamps; MFT die-namics; Pretty Pink Posh scallop frames die; confetti and Copic markers. 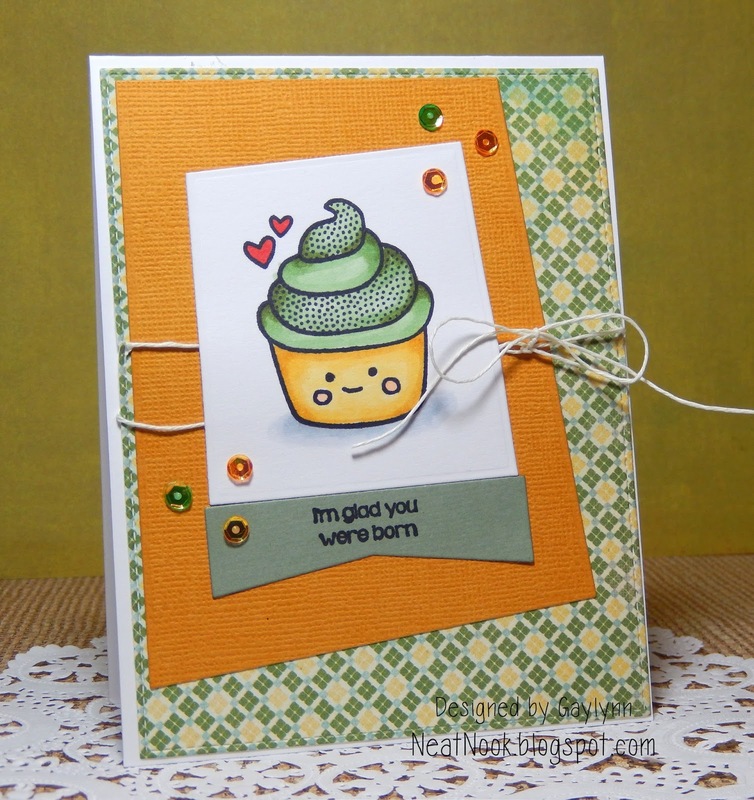 Today I am sharing a sweet cupcake birthday card. Sentiment: I'm glad you were born. This is one of my favorite sentiments. I paired it with an adorable cupcake and used color inspiration from Unity Stamp Co.'s Facebook Color Challenge this week. Supplies: Unity Stamp Co. So glad you were born, Copic Markers, MFT die-namics, sequins and cording. 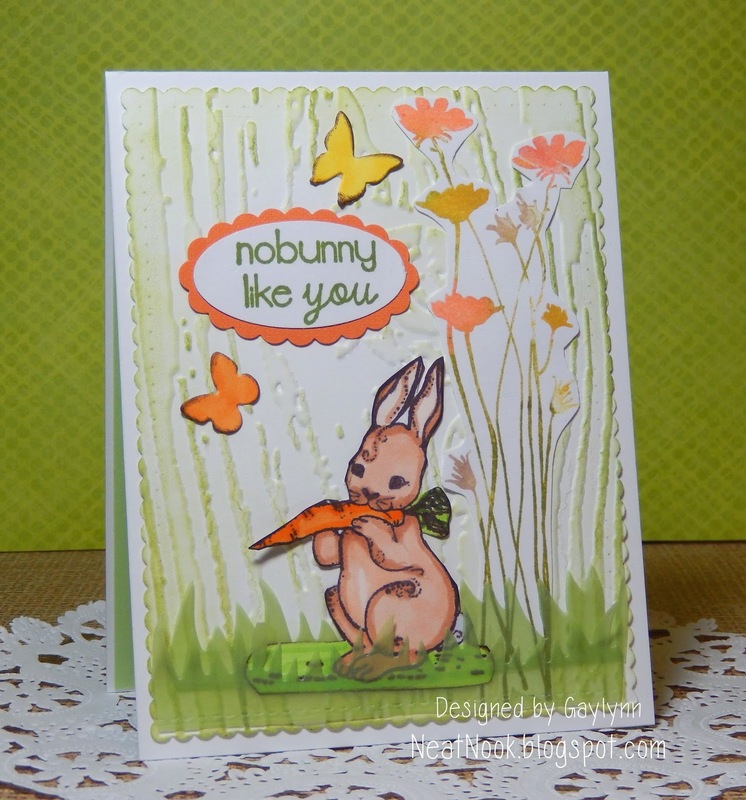 This is a Spring bunny rabbit card for Easter or anytime. Front sentiment: No bunny like you. Supplies: Unity Insightful Meadows, Hunny Bunny and No Bunny; MCT grass dies and Wishing You stamp; Copic Markers, Distress Ink and wood grain embossing folder. 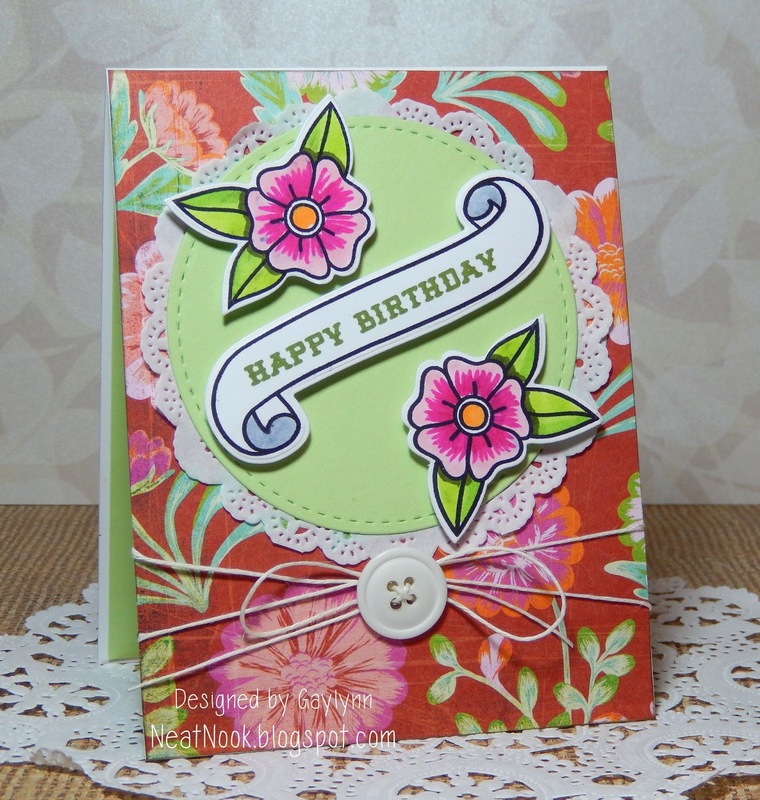 This floral card is going to be for a Spring birthday. Spring was on my mind for this one. I added flowers everywhere with dimension and trimmings. Supplies: Lil' Inker Designs stamps and dies from Vintage Ink and Stitched Mats Circles, Copic Markers, twine, doily and BasicGrey paper. Here is a cute little kitten that wobbles and shakes when you touch it. This is going to be a birthday card for a sweet little princess in the family. Sentiment: Happy birthday to you. This has a lot of steps to it. Here is a photo of the items used to make the background. The cat was colored in and popped up with an Action Wobble spring. It looks adorable as it wobbles back and forth to the touch. 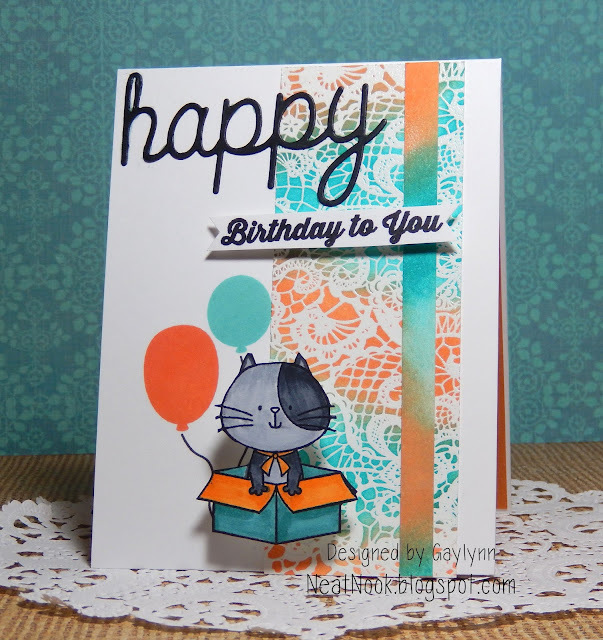 Simon Says Stamp Monday Challenge ~ Make your own background. Supplies: MFT Stamps and Dies from Lace Background, Totally Happy, I Knead You, Birthday Wishes and Balloons, Happy dies; Copic markers, distress ink, Action Wobbles and embossing powder. I hope you enjoyed this. Have a fabulous day. This one was made special for friends who are moving away. Sentiment: Good luck. Good things are going to happen. 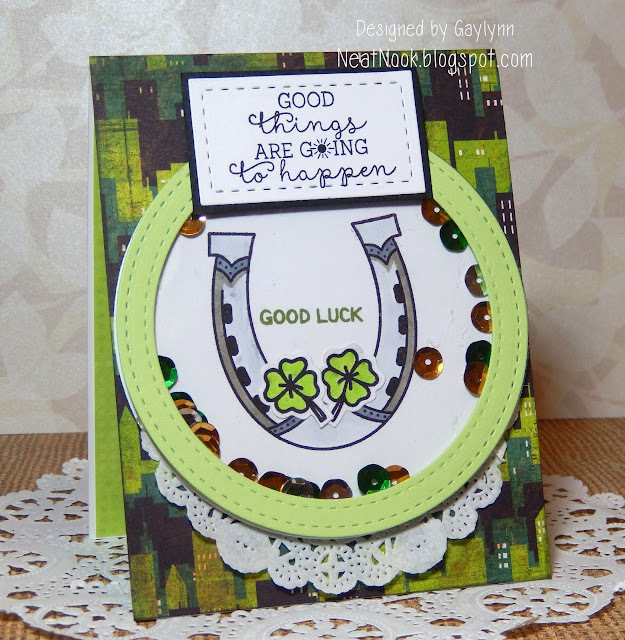 This is a shaker card featuring a horseshoe and four leaf clovers. I think this would be great for encouragement, going away, school or St. Patrick's Day. I chose the Shabby Chic Style for this card. Supplies: Lil' Inker Designs stamps and dies from Vintage Ink, Send Pretty Greetings, Stitched Mats Circles and Stitched Mats Rectangles Dies, sequins. Here is a drinking themed celebration card meant to be funny and fun. 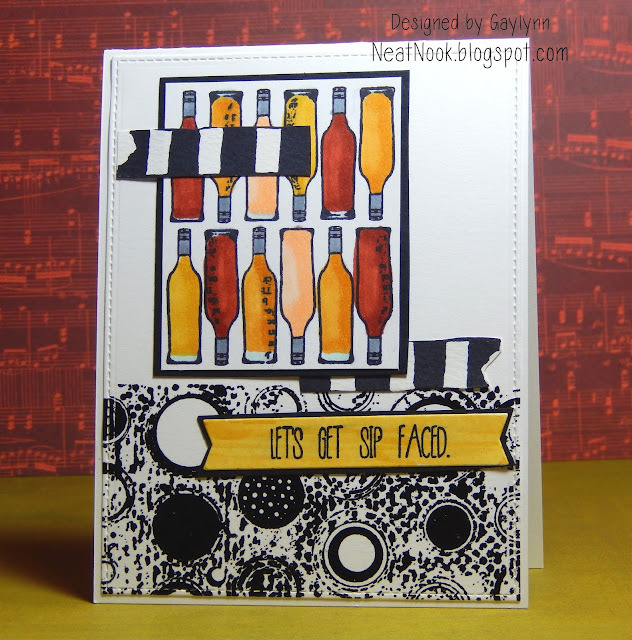 Sentiment: Let's get sip faced. This is going to be for a birthday, but it would work for any celebration. I like the pun with the alcohol bottles ... wine, beer, liquor. The background is heat embossed and Copic markers were used on the bottles and tag. I balanced the top image with the bold bottom section by adding stamped washi stripes. The Unity Stamp Co. Facebook Sketch Challenge is the inspiration for the layout. Supplies: Unity Stamp Company Let's Get Sip Faced, In Circle Me and A Little Bit Washi; MFT die-namics, Copic markers and embossing powder. 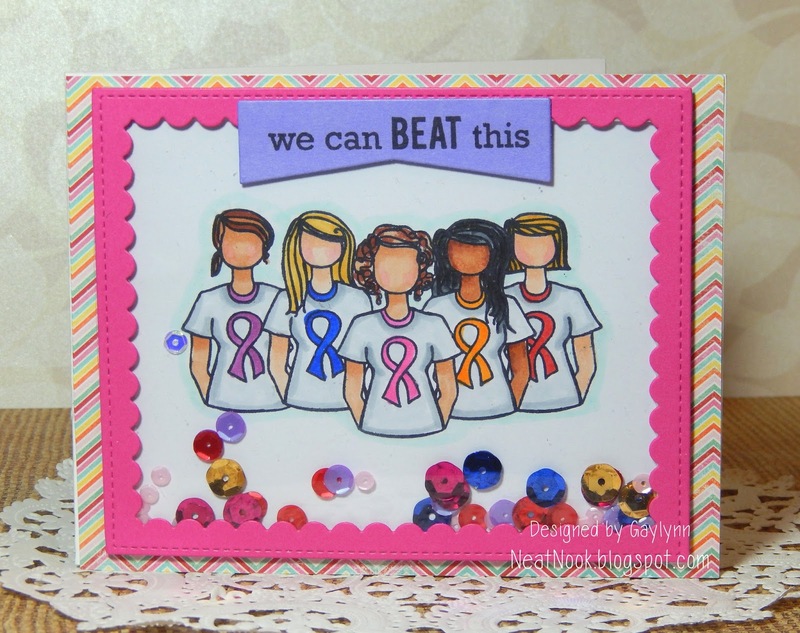 This is a card for cancer and heart disease awareness and support. Sentiment: We can BEAT this. I made this a shaker style card and filled it with sequins of different colors and added an supportive sentiment tag. Supplies: Unity Stamp Co. Cure Girls, Pretty Pink Posh Scallop Frames and sequins, MFT die-namics, My Mind's Eye paper and Copic markers. Thanks for visiting. Have a wonderful week.